or how we brought this old beast back to life. The Henry 2K linear amplifier is a single stage amplifier designed for SSB, CW , FSK and AM operation. It required between 80 and 100 watts to drive a pair of 3-400Z triodes to 2000 watts PEP input. The 2K was designed in the days when the ham power limit was 1 kW input. The power supply was capable of much more. The Henry 2K is a floor mounted cabinet design, with the power supply located in the bottom of the cabinet and an RF deck attached to the top. The design is very simple as with all of these vintage amplifiers. The 2K was built from 1961 to 1965 later improved versions where available. At 154 pounds this amplifier is "built like a tank". However, the RF compartment of the 2K has a very low profile. The interior height is just enough to accommodate the height of the 3-400Z with plate cap. The taller 3-500Z will not fit into this amp without major cabinet modification. So if you have one of these, search for 3-400Zs. They haven't been in production since 1965. This particular amplifier belongs to WS0B, Glen and is Serial Number 614. This amplifier can operate on either 110 or 220 volt house current. It has a 12 volt T/R relay system which will work with almost any modern or vintage exciter. The exciter only needs to provide a ground to the center of an RCA jack to key the Henry 2K. You don't need a soft switch modification. The 2K Amplifier is a simple grounded grid design, the use of the zero bias 3-400Z makes the power supply even simpler than others that use 3-500Zs or any other tube requiring grid bias when operating. Most Henrys feature a Pi-L tank circuit rather than the simpler, straight Pi found in most modern amplifiers. There are important advantages to the Pi-L. The Pi-L tank circuit provides an additional 10-to 15-dB. attenuation of the second harmonic and even more attenuation on the higher-order harmonics. Glen's amplifier was not functioning for an unknown reason when we started working on it. Since it quit without warning and didn't smoke it was assumed to have a minor problem. The manual explains operation and provides a schematic but no real maintenance information is provided. So we had to guess as to how best to go about troubleshooting this beast. We decided to first do a visual on all components and make measurements with the power off. This meant taking the unit apart so that internal components could be examined. Getting the RF deck off of the cabinet can be a bit of a puzzle. You have to do this disassembly to reach the components under the RF deck. 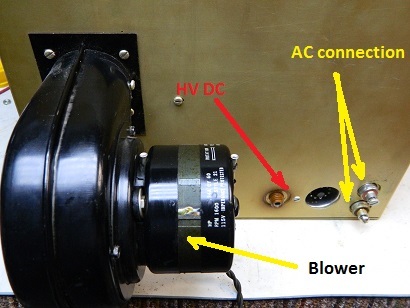 In order to free the RF deck from the cabinet first insure that the AC power has been disconnected and the power supply allowed to bleed its high voltage down to zero for at least 20 minutes. There are deadly DC voltages produced in the power supply and these can be lethal. Once given some time to discharge the power supply should be safe, open the bottom front cabinet door, a "dead man" interlock will short out any remaining DC. If you hear a loud bang you didn't wait long enough or the bleeder resistor pack is bad. (More about this later). The next step is to remove the top of the RF deck, this requires turning the 4 Zeus fasteners and lifting of the lid. Inside the cabinet along the left and right sides you will see many lines of sheet metal screws. To remove the RF deck from the floor cabinet you must remove the 3 screws on each side that are closest to the edge of the floor cabinet. 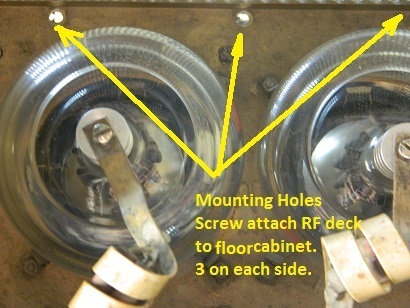 Also remove the three screws at the back of the RF deck that passes through the main floor cabinet. Now the RF deck should be free to come off the floor cabinet but you will also need to disconnect the power supply wiring first. Reach under the RF deck and unscrew the High Voltage DC lead. Next pull the octal power plug off of the deck. Gently lift the RF deck up until it just clears the floor cabinet then turn the deck on its side allowing it to rest on the floor cabinet. Note the two AC power wires that go to the screw terminals. Remove these while observing the color code on the wires. Mark the chassis near the terminals so you will know where these wires go later. In our unit White/Red wire goes to the back terminal while a White/Yellow is towards the front of the RF deck. Note that the blower also connects here. Those two black wires make no difference as to which terminal they connect to. Once all wires are free you can completely remove the RF deck assembly from the power supply and set it aside. To remove the floor cabinet from the power supply, remove the five screws from the sides of the floor cabinet near the bottom. There are two on each side and one in the back. Also remove the bottom screw from the skirt panel and the magnet interlock module near the door opening. Now the floor cabinet should slide up and away from the power supply. Why do this you might ask? Well in order to get a probe onto the 3 large bleeder resistors you will need to remove the power supply from the cabinet. It also makes cleaning the unit much easier. 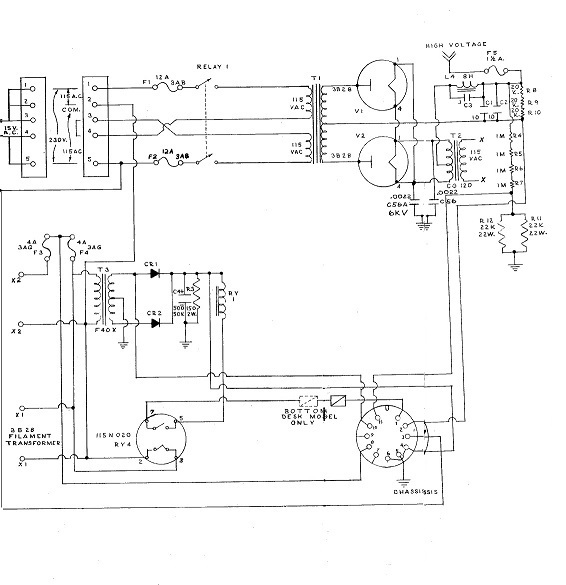 See Figure 1 for a schematic of the power supply. In the above photo you can see how the fan evenly distributes the grim and dust on the power supply and the cabinet walls. This dusty grim can cause the high voltage to arc and snap and should be cleaned away with a degreaser. Do not use an oily cleaning solution or water on the power supply. Warm soapy water will do fine on the cabinet. In the photo above you can see the three 20K 100watt high voltage bleeder resistors. In our unit one of these failed causing the power supply to produce a higher than normal no load voltage. Surplus Sales of Nebraska had these in stock for $8.00 each. Part # RWM 12-104. We replaced one resistor but now wish I had replaced them all. In the photo to the left you can see that the old bleeder resistor fell apart once the mounting flanges were removed. It's a good idea to clean off the ceramic insulators to prevent high voltage leak paths. Use warm water soapy water to wet a rag and don't leave an oily residue. Paper towels will snag on the sharp edges. When re-soldering these bleeders make sure there are no sharp points or stray wire hairs. All joints must be rounded to prevent high voltage leakage. Once these bleeders have been replaced or checked to be good, it's time to look under the chassis for other decaying or burned up parts. If you can lift the 135 pound power supply place it on your work bench and turn it on its right side. (Do not set it with the front (tube side) down as the supply can roll over and that might damage the tubes). Remove the bottom plate and you will find the smaller power supply components. Measure all of the resistors on the component carrier. There is a 22K 2 watt resistor under the component carrier board. This is R11. On top you will find another 22K 2 watt resistor. It is R12. These two resistors are in parallel so they will read 11K Ohms if good. The next 4 resistors are 1 megohm and they along with R11 and R12 form the high voltage divider network used by the Multimeter to scale down the High Voltage. When measuring these resistors make sure that the "dead man" switch post is not grounded. If it is you will read about 750K across each resistor and you might think the resistors are bad. None were bad in our amplifier. They should each read 1 megohm, Next check the Low Voltage components. These are pointed out in the photo below. A visual inspection told us that our LV supply was in a bad state. In this photo you can see the under chassis power supply components. In our amplifier R3 was a pile of carbon. CR1 had shorted and unsoldered itself, and C4 was leaking capacitor juice. I didn't have a 150 ohm 2 watt resistor so for a temporary fix I put a 47 Ohm and a 100 Ohm resistor in series to make the needed 150 Ohm value for R3. I replaced C4, originally a 500 mfd 25 volt capacitor with a 470 mfd at 50 volts. I also replaced CR1 and CR2 with 1N4007 diodes. The originals were 600 VPIV @ 600 ma, so 1N4007s should work fine. When working under no-load conditions the circuit should produce 14.5 volts DC as measured across the 150 Ohm resistor. The transformer has a 110 volt primary winding and the circuit is a full wave rectifier with capacitor input filtering. The Power Supply was reassembled and set aside while we examined the RF deck. During the RF deck inspection we noticed that one of the 3-4000Z s had a loose filament pin. This could cause the filament not to light. It was re-soldered and the filament checked for continuity. 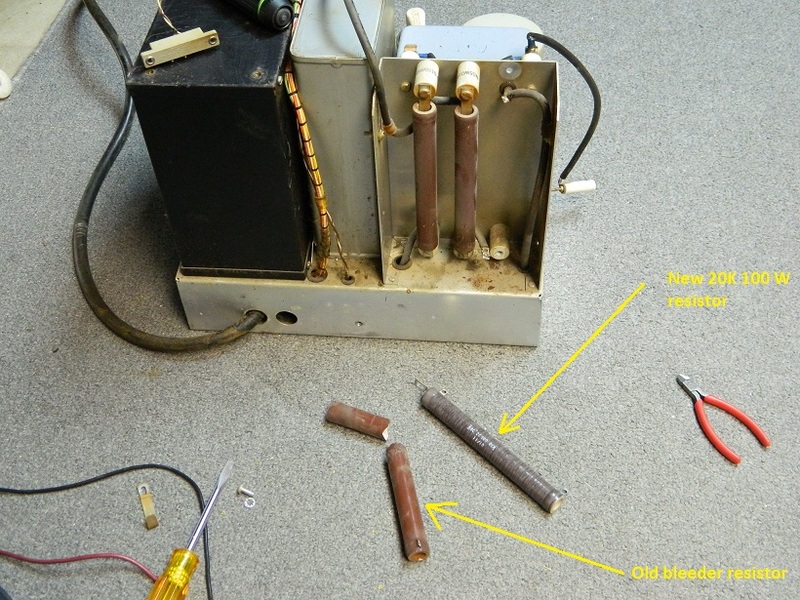 We also cleaned the tube sockets to insure that the filament voltage would make a low resistance connection. Thanks to Ron, NE0X we were able to quickly track down these filament issues. 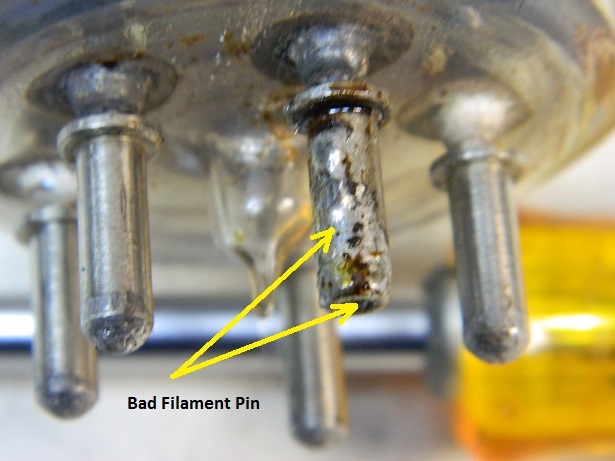 Keep in mind that if you do have poor filament connections, the filament pin can heat up and the solder can actually melt out of the tubes pin and cause the circuit to open. I used some emery cloth to clean the contacts of the tube sockets. This tube had previously been repaired and flux was left on the repaired pin. 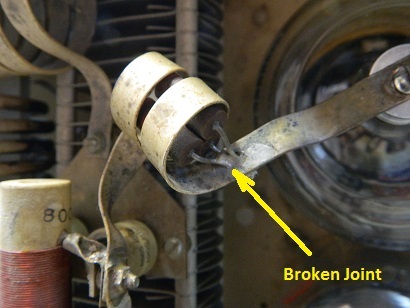 The pin that comes out of the tube's glass envelope is soldered to the socket mate at the factory. Due to age and filament pin heating these pins often become open and must be cleaned and re-soldered. 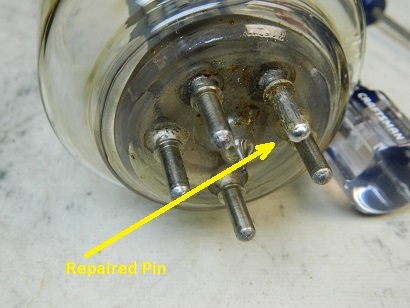 Not only should you re-solder the pin and clean the flux off of it, but you must clean the mating tube socket pin. This will ensure that the filament makes good low resistance contact and reduces future pin heating. 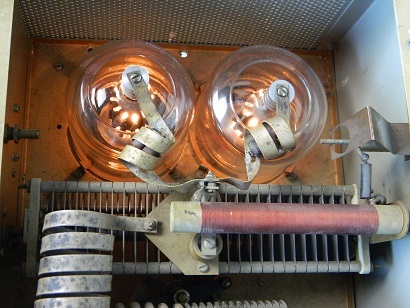 The repair was successful and both tubes are lighting as shown in the photo below. In Figure 2 below you can see the circuitry of the RF deck. The circuit is relatively simple and it only takes a few minutes to check the components visually and electrically. We found no problems under the chassis. Glen did say that the Plate Current meter had stopped working. An Ohm meter check of the plate current meter confirmed the meter was open. These meters cost over 100 dollars on the surplus market when they can be found. They are rare but from time to time show up on ebay. The meter was removed and disassembled. Inside we found an open shunt wire. This wire was repaired and the meter was checked at half scale (500 ma). The meter was reading 5% low but well within a usable tolerance. The meter was reassembled and reinstalled and confirmed to work during final testing. Be careful not to use magnetized tools when working on meters. Plastic or aluminum tools are recommended. In the above photos you can see the under chassis components. The most likely to fail components are the 3 resistors. These were all in good condition with no signs of over heating. For a 40 plus year old amplifier the massive band switches were clean with no signs of burns. Over all the amplifier's RF deck was in excellent condition. Later however, during the initial power up, we heard the blower motor squeal. This motor provides the cooling to the two 3-400Z tubes and must operate to keep temperatures within a normal operating range. This motor can be oiled but oiling did nothing to cure the bearing squeal. The motor was disassembled and it was found that the main shaft had a very sticky brown residue on it that prevented the shaft from turning in the front bearing. So the bearing was turning in the housing rather that the shaft in the bearing. A good cleaning with a degreaser and some oil cured the problem and the blower ran quite and much faster than it did previously. One other item that needs a good visual inspection is the plate caps and suppressor assemblies. It our amplifier one of the solder joints had broken away from the suppressor coil. This is the point were the resistors solder to the coil. All of these solder joints were checked and two were re-soldered. Also one of the plate caps was loose on the tube and it was secured with an Allen wrench. The band select switch on these amplifiers take a lot of force to move. This is partly due to the large RF switches that are used and the dial cord type system that turns the 3 rotary switches. A bit of lubricant seemed to help but not that much. The knob on the band select switch was cracked and it was necessary to replace it. It's still hard to turn the band selector but we assumed that to be normal. The Amplifier was reassembled into a complete unit with the RF deck married to the power supply and floor cabinet. Initial tests indicated that the unit was ready for service. There were no load noises, hissing high voltage or fan squeals and all the functions seemed to work. NE0X and I fired her up and applied a modest 10 watts of CW drive at 7.2MHz and the old Henry tuned up smoothly with a 300 watt output. We advanced the drive to 60 watts and observed 650 watts. Later we tested at a full 80 to 100 watts of drive and saw 900 to 1100 watts peak into a dummy load. Now for the ultimate test, WS0B will use the amplifier on the air. Good News ! 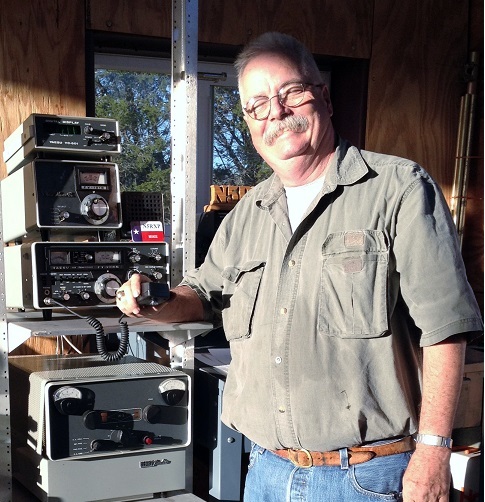 WS0B reports that his Henry 2K is producing 650 to 700 watts with 60 watts of drive. He is getting great reports with 12 to 14 dB of gain at the receiving end. Audio reports are excellent as well. Not to bad for a pair of original 1963 tubes. It's time to start looking for a new set of 3-400s or maybe even 3-500Z tubes. Mike N5RXP just completed his Henry restoration and is on the air. According to Mike, Ted Henry is supplying replacement HV diode modules that are better than the originals. "The OEM HV diodes that comprise the bridge are discrete components and when you look them up on the web, the mfgr does not recommend using them any longer. Ted Henry's replacement's package is of two HV diodes in series and he claims they are an upgrade, so you might want to look into that. (You will need two to make a full wave bridge)"
Thanks Mike for the update on your Henry project and FT101 exciter. 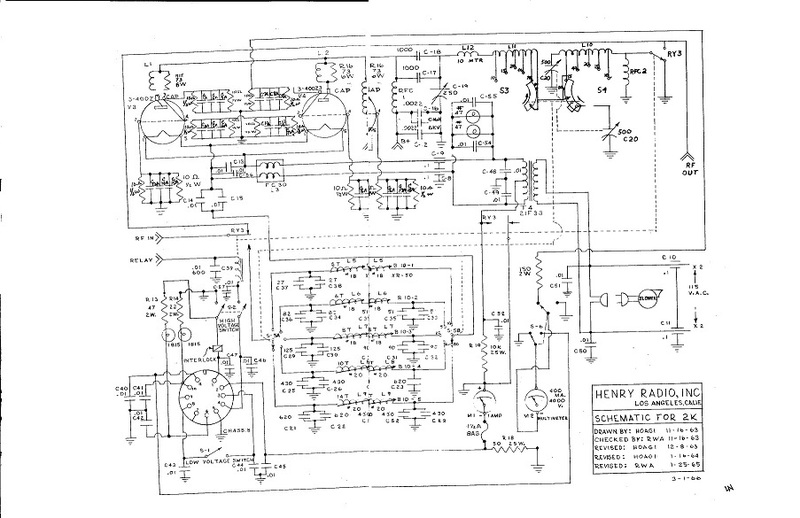 NE7X's web site http://www.ne7x.com/henry_rf_amplifier_info_center.htm is no longer on the internet.. 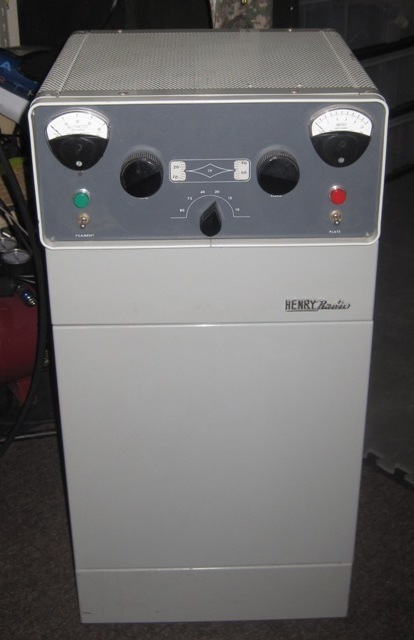 This site had lots of information on all of the vintage Henry Amplifiers. You may still be able to contact NE7X via QRZ.